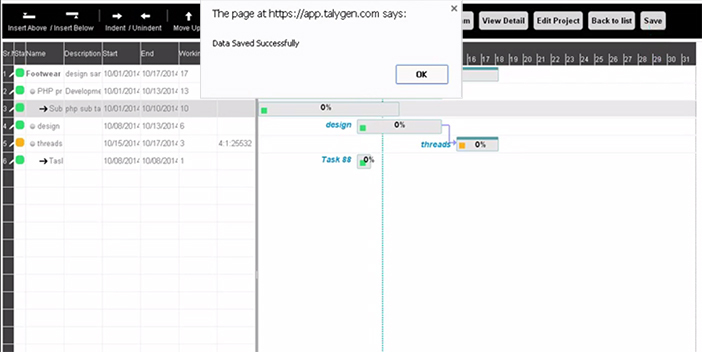 Talygen helps you to manage your projects from a single screen with Gantt chart. Follow the below given steps to learn managing Gantt chart. 1. Go to Full Menu > Project. 2. Click on the gantt chart icon of the particular project. 3. Click on the project name and enter the description. Select the status, start date and end date. 5. To get the Team members details, click on Project name and then click on Team members tab. 6. To create task, click on Insert Below and enter the project name. Now click on task name in Gantt chart. 7. Enter the description, select the status, start date and end date. Enter the hours to be billed and billability. Click on Save to update the task details. 8. To create the sub task, create a new task and click on ‘indent’. The Task will get indented into the parent task. 9. Click on the sub task and enter the description and select the status, start date and end date. Enter the hours and billability. Click on save to update the information. 10. Click upon the task to create dependency. Select the Task and days for dependency and click save. To add the resources, click on the task and select the users. Click on Save. 11. 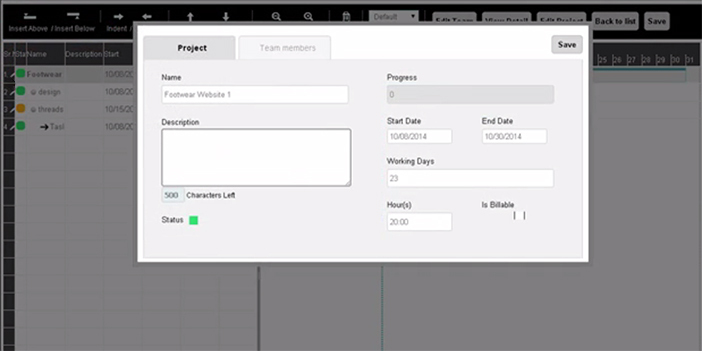 Click upon ‘Save’ button at your Gantt chart screen to save the complete project changes.